Stir ingredients with ice and strain into an rock glass over large ice cubes. The Savoy Hotel in London is one of the most prestigious hotels in the world and celebrated its 125th anniversary in august 2014. With the Dry Martini Cocktail being the hotels best selling cocktail, headbartender Erik Lorincz created together with his team of the American Bar the Savoy Martini, a tasty mixture of dry gin, dry vermouth and bitters. The Bitter Truth produced a limited number of 250 bottles of a Savoy Martini Bitters for the Savoy Martini which is used alongside a special bottling of a rare Cocchi dry vermouth and house dry gin. 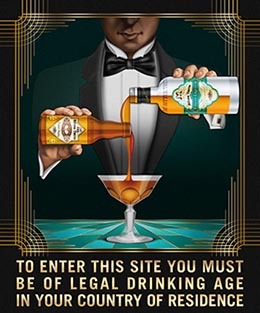 The Savoy Martini Bitters are used at the American Bar and are available for sale solely at the Savoy at a price of 30 GBP. Stir ingredients over cold ice and strain into a chilled cocktail glass and add a zest of bergamot peel relasing the essential oils of the peel. When to Shake and When to Stir a Cocktail is a question quite often asked. Robert Hess gives advice in this little video from Small Screen on Vimeo making 2 versions of a Manhattan Cocktail. The answer is relativly simply as cocktails based on clear ingredients should be stirred, while cocktails using already cloudy ingredients or ingredients that are thick should be shaken. Learn how its made the right way! Stir with ice. Strain into a cocktail glass. Garnish with a cherry, lemon or orange zest. How To Choose the Right Glassware for Your Cocktail – The Cocktail Spirit with Robert Hess from Small Screen on Vimeo. There has always been confusion about the right glass picked for the right drink and its time to give simple advice. At Small Screen`s recent video Robert Hess is explaining how to do it right. Mornings can be difficult to deal with, especially if you had a night out before and you are still suffering from the aftermath of your alcoholic delights. Fortunately our forefathers and mothers restoring concoctions that might help gently lift our eyelids to greet the day. In this episode, Robert Hess shows the Eye Opener Cocktail based on some aged rum, apricot liqueur and an egg yolk making it perfect for breakfast or brunch. Dry shake to emulsify ingredients. Add ice to shaker and shake to chill and dilute. Strain into a chilled rocks glass. This gin cocktail plays off Jamie Boudreau`s Golden Ration for cocktails: 1 1/2:3/4:1/4 but here he reduces the amount of vermouth to 1/2 ounce. To cut the sweetness of the Gold Wasser (not schlager) ever so slightly, Jamie utilizes a simple technique using lemon zest. Stir ingredients with ice. Spritz oil of large lemon zest over chilled coupe. Add zest to glass. Strain cocktail into glass then remove lemon zest.